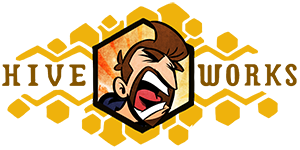 Hey, maybe go preorder that snazzy Wil Wheaton plushie if’n you’d like to get one before Xmas. Blockbuster Video is a Dallas-based entity (I’m not sure that “business” is the right word), so if you are going to see one in operation, you are probably going to see it here. There is actually one not too far from my house. Every time I drive past it, I get this screwed up look on my face that puzzles and posits, “How? Why? And more importantly, WHO! ?” Who is perpetuating this video rental life support with their patronage? I mean, we could go on and on debating “quality of life” and what is or is not a “vegetative state,” but surely we as a society must have enough collective mercy to pull the plug. Considering I haven’t stepped foot in a Blockbuster for nearly a decade, I can only assume that they are but gutted out husks used for staging some sort of Mad Maxian societal apocalypse scenario. Maybe each Blockbuster is seeded with a few employees, a handful of customers and their children and once the doors are locked government officials watch on closed circuit cameras and time how long it takes for everything to go all Lord Of The Flies. My guess is it’s just after the 4th time the in-store tv’s play the trailers for Miss Congeniality. I was inspired to make this comic upon remembering a photo that I had seen online of a “Blockbuster wasteland.” A little research showed that it was posted on Tumblr by none other than my friend Wil. Once I realized that, I changed the alt text, which had previously said: I was 30, going on 31 the first time I saw a dead former retail giant. Spooky. 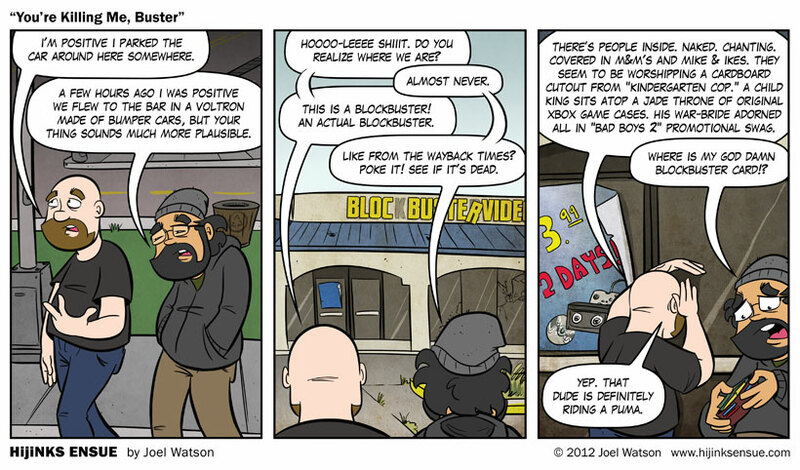 COMMENTERS: When was the last time you remember regularly using a Blockbuster? Do you STILL?! What happened to you? Are you OK? Remember walking all around a store for sometimes an hour only to go home empty handed? That is how people used to live ! Any other particular stores or services that you used to use every day that have since been totally replaced by technology? Tags: blockbuster, Storyline: And The Bartender Says "Why The Long Face?"